Painted during Easter Sunday worship service. I imagined what it might have been like in the tomb at the moment when Jesus came back to life. There are a few things that we don’t know, like whether the stone was rolled away before Jesus walked out of the tomb, or whether He walked through the wall. Some scholars have speculated that the stone was rolled back simultaneously during the earthquake, and that this could have occurred at the time of the resurrection. 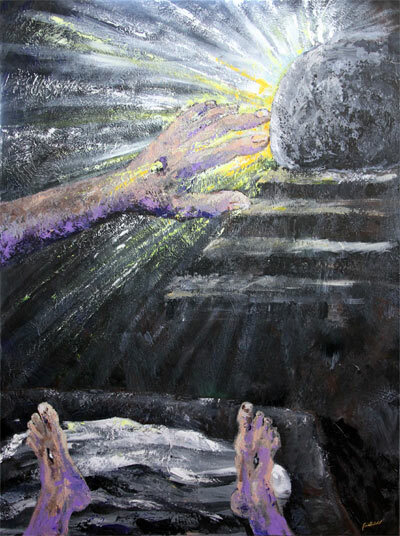 So I imagined a moment in which perhaps the stone was just beginning to move; a crack of light entering the tomb as Jesus comes back into His body. Maybe He would raise His hand, as we might if we were awakened to a bright light. We also don’t know whether the scars in Jesus’ hands and feet remained as holes all the way through the flesh. In The Passion of the Christ, it was depicted as a hole through His hand, which I thought looked pretty cool. So if there were a hole in His hand, just imagine if He held it up to block the light from His eyes, and light came streaming through the hole. Again totally speculative, but fun to think about.